On the weekend of January 1-2, 2011, the faithful of Christ the Savior Orthodox Church welcomed His Beatitude Metropolitan Jonah, together with special guests and visitors, for the 10th anniversary celebration of the Mission's founding. On Saturday, January 8th, members of Christ the Savior joined Fr. John Stavropoulos and St. George's Greek Orthodox Church of Ocean City, MD, for their annual Blessing of the Atlantic Ocean. The festivities were led by His Eminence, Metropolitan Evangelos of the Greek Orthodox Archdiocese. Many thanks to Fr. John and the community of St. George for hosting this wonderful event to the glory of God! 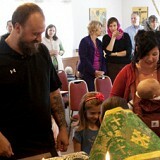 On Sunday, January 9th, Eric Daniel, son of Andrey and Anna, was baptized into the Orthodox Church. May God grant Eric Daniel, his parents, and his sponsor, Vladimir, many blessed years! On Sunday, January 23rd, the parishioners of Christ the Savior gathered together for the Annual Meeting. In addition to reviewing the minutes from last year's meeting, the Parish heard reports from the rector, senior warden, treasurer, and committee chairpersons. 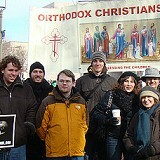 On Monday, January 24th, members of Christ the Savior traveled to Washington DC for the annual March For Life. The march is a pro-life rally protesting abortion, held in the nation's capital near the anniversary of the decision in the United States Supreme Court case Roe v. Wade. Many marchers also protest the use of euthanasia. On Sunday, February 13th, with the blessing of our diocesan hierarch, Metropolitan Jonah, the 2011 Parish Council members were installed into office. During the first meeting of the 2011 Council, Alice Peters was elected Junior Warden and Deborah Wilson was elected Secretary. May the Lord bless them all! 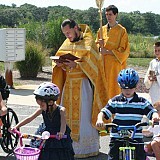 Over the years, our parish has been blessed with many young children. As we all know very well, their innocence, simplicity and indefatigable zeal for life provide a great example for us to emulate as we seek to enter the Kingdom by becoming childlike. 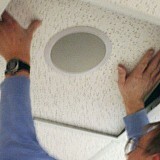 In an effort to give back to our children and their parents, we have decided to purchase a new sound system for the church. On Sunday, March 20th, our excellent seamstresses from our parish, Diane Evanusa and Alice Peters sewed new blue liturgical covers which we will use for Annunciation this coming Friday. May the Lord reward them for their efforts! On March 21-22, a group of faithful from Christ the Savior and the Salisbury University OCF made a lenten pilgrimage to St. Tikhon's Orthodox Monastery and Seminary in South Canaan, PA.
On Palm Sunday, April 17, 2011, over seventy people gathered for the celebration of the Lord's Entrance into Jerusalem as well as the reception of the Morsey family into the Orthodox Church through Holy Chrismation. The services of Holy Week, and Pascha were celebrated at Christ the Savior from April 17th through April 24th. Many parishioners, family, and friends gathered for these most solemn liturgical celebrations of the Lord's Passion, Death, and Resurrection. We, at Christ the Savior, greet you all with the joyous exclamation, "Christ is risen! Indeed He is risen!" With the help of John Kokkinos, a parishioner from nearby St. George's, a new English text was installed into our Gospel Book. 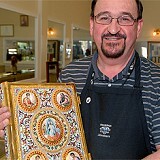 John is an expert craftsman, who has offered his talents to the Orthodox Church on similar projects, such as preparing a beautiful riza for the myrrh-streaming Iveron icon of Hawaii. On Sunday, June 12, the faithful gathered to celebrate the feast of Pentecost which commemorates the descent of the Holy Spirit upon the Apostles fifty days after the Lord rose from the dead. As is customary, the Vespers for the Day of the Holy Spirit together with the Kneeling Prayers were served immediately following the Divine Liturgy. On June 24-26, nearly a dozen members of the Mission traveled to New York and New Jersey to visit churches and to attend a seminar on Orthodox Architecture at St. Vladimir's Seminary given by Andrew Gould of New World Byzantine. On Saturday, July 2nd, we had our annual summer yard sale. The weather was hot but the snow cones were cold, and the event was well supported both by parishioners who hosted the sale and also by the local community who came to purchase items. The event raised over $1300 for our building fund. Many thanks to all! 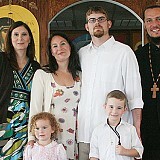 On Sunday, July 3, 2011, we welcomed the Hageman family into the Orthodox Church through Holy Baptism and Chrismation. We extend our joyous congratulations to Andrew, Kelly Elisabeth, Oscar Ignatius, and Alma Linda Irene! May the Lord continue to bless their family, granting them health, strength, salvation, and many blessed years! On Sunday, July 17th, we had the annual blessing of automobiles, which occurs on the Sunday closest to the feast of the Prophet Elias (who ascended as if into heaven in a fiery chariot). We were pleased to welcome the youth group of St. Mark's Orthodox Church in Bethesda, MD. On Friday evening, August 19th, Lee Gregory Krempel and Jamyla Williams were united in holy matrimony. We, the faithful of Christ the Savior, congratulate them on this joyous occasion and we ask that the Lord who has united them, blessing their marriage as He did the marriage in Cana of Galilee, continue to grant them health, strength, salvation, and furtherance in all good things for many blessed years! On Sunday, August 21st, Kathryn Rose received Holy Baptism, beginning her life in Christ. We congratulate her, her parents, Rob and Jenny, her sponsers, Matthew and Sophia, as well as their whole family. May the Lord grant them all many blessed years! On Sunday, September 4th, prayers were offered for teachers and students on the occasion of the new academic year. May God grant His wisdom and understanding to them all! On Sunday, September 25th, Andrei Labai and Lena Maskalyova were united in the mystery of Holy Matrimony. The service was performed at St. Alexander Nevsky Cathedral in Howell, NJ. We heartily congratulate the newly wed couple, Andrei and Lena, asking the Lord's divine blessings upon them. May the Lord grant them health, strength, salvation, a furtherance in every good thing, and many blessed years! On Sunday, October 9th, the Feast of St. Tikhon, the Enlightener of North America, the parishioners of Christ the Savior Mission assembled for a Special Parish Meeting and voted unanimously to purchase a 15.1 acre, 4300 square foot estate located at 10315 Carey Road, Berlin, MD, to serve as their parish center. On Wednesday, October 19th, the Myrrh-streaming Iveron Icon of Hawaii visited St. George's Greek Orthodox Church in Ocean City, Maryland. The faithful from the area packed the church for this special occasion, offering a supplicatory canon, venerating the icon, and then being anointed with the holy myrrh which miraculously streams forth from the icon bringing consolation and healing. A Letter to the Benefactors of Christ the Savior Mission: It is with profound gratitude that I write to you on behalf of Christ the Savior Mission in Delmarva for with your help and by the grace of God, we have successfully met our $20,000 matching donation challenge! In fact, due to your generosity, we have not only raised the $20,000 – which has already been matched by the anonymous donor – but we have actually done this with two months to spare! On Friday, December 2nd, Christ the Savior Mission closed on its new property, located at 10315 Carey Road, Berlin, MD 21811. This 15.1 acre property has a 4300 square-foot home which will serve as the new parish center, housing a chapel, fellowship hall, and rectory. We give thanks to Almighty God who has guided and blessed this endeavor! We also extend sincere and heartfelt appreciation to those who, inspired by divine grace, selflessly sacrificed to make this happen! Today we extend our festal greetings to you all as we celebrate the Nativity of our Lord, God and Savior Jesus Christ! We humbly ask the Lord's blessing upon you for a joyous, peaceful and grace-filled festive season and new year. Christ is born! Glorify Him!